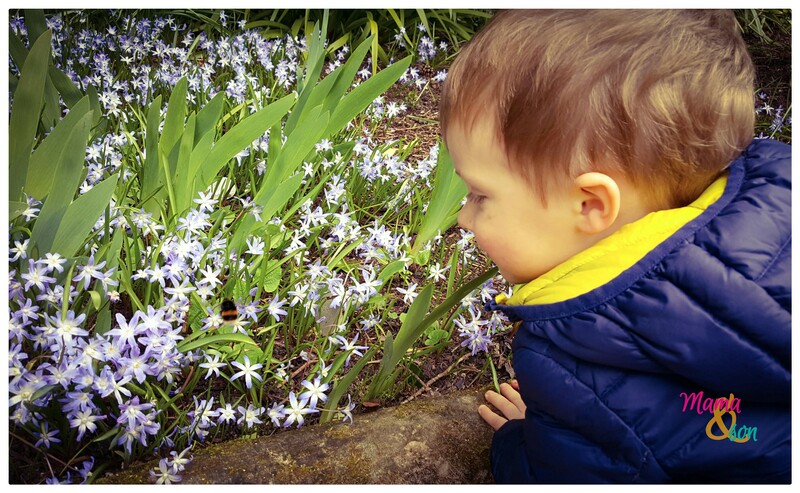 I think I already mentioned in our previous post Watch it wriggle – how to make your wormery that Teddy loves to go out and watches bugs every day and you should see his excitement every time he finds a little beestie he hasn’t seen before. Well, he does get excited pretty much with every bug or a spider but a new species is always special! Sometimes I am really surprised that, the bugs keep staying in our garden. Imagine every day someone lifts a roof above your head and then watches your every move, you would want to move somewhere else, wouldn’t you? I must add that he is very gently with them. He usually just watches them for a while and then he carefully returns the stone, log or a plan pot back to its place. He does not touch them, only occasionally he asks me to help him catch one so he could observe it closely so we put it n a glass box and Teddy has a better look, and then we always set it free. We love the diverse insect life right on our doorstep. We always do our best to accommodate their needs and help them thrive. That is why our garden is full or rocks, pebbles, logs and other thing to provide shelter. We also have few bug hotels. Well, no complex structures just our natural version of it which works perfectly. 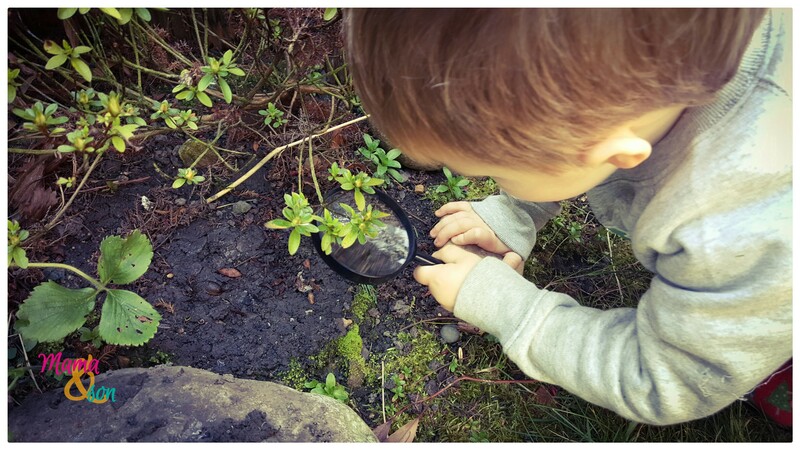 While exploring woodlands we collect nature treasures such as pine cones, bark, pieces of wood lying around and then we place it in the garden, making additional shelters for our bug friends! This is on of our ‘hotel’ that is always full of life and great place to spot wolf spiders that made their shelters among the bark. We also love bees and butterfly and we always try to plant great variety of flowers for them to pollinate and feed from. 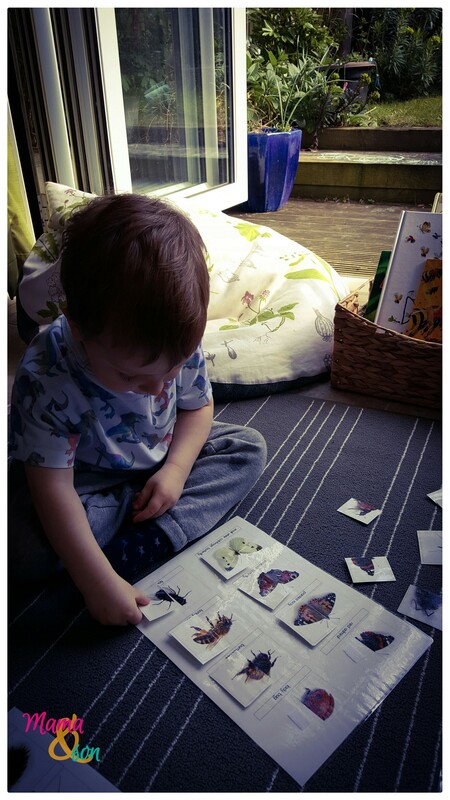 Teddy absolutely adores bumblebees and is capable to spend even an hour to just sit and watch them work. Our great collection of stones has unfortunately attracted a rather extensive population of slugs and snails, well I say unfortunately, Teddy loves them but my plants don’t! Last year we spend weeks to grow peppers and tomatoes from the seed and when the plants were big and strong we put them outside looking forward to the fruit of our labour that would soon to come. Well it didn’t! Only a day after, there were only stalks left and I am not kidding, not even a one leaf left, just stalks and thousands of silvery slug’s trails! We do not have the heart to kill them, we managed to collect a full bucket of snails in very short time and we took it behind our house, hoping they would just get the message and move on. That evening I felt like in the middle of a Hitchcock movie, well no birds but our window was covered with snails.! They just climbed up across the house back to the garden! So I guess we just have to keep them! 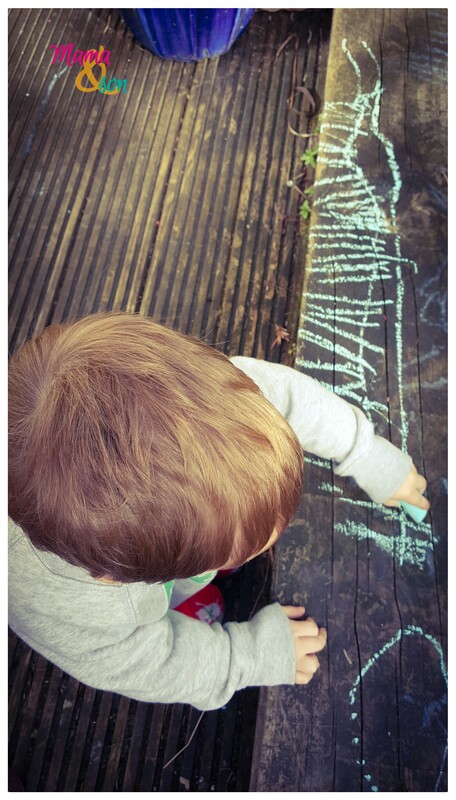 Teddy also started to draw all the animals he finds in the garden so I think the next step will be to start a journal and record all our findings. If you haven’t recognised it, this is his take on black millipede which is one of our regular residents. 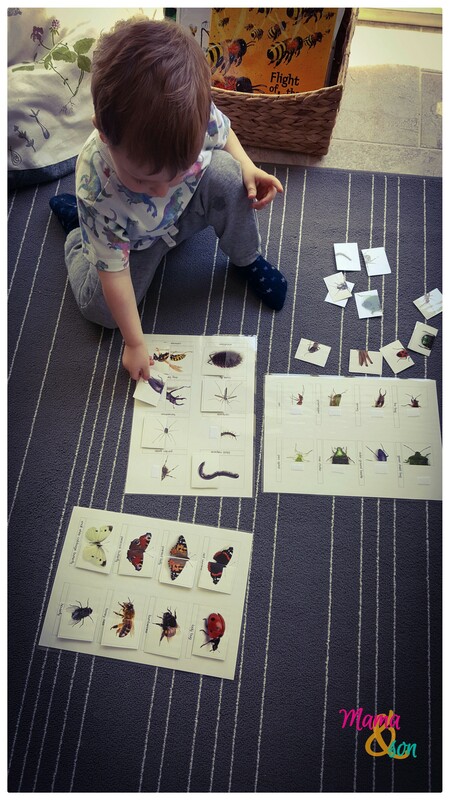 He has been showing more interests in learning full names of all the creepy crawlies so apart from a magnifying glass, our pocket book of British garden wildlife is a must. I have also decide to make him puzzle with the most common beesties found in our garden. Thank you for reading us and if you have more ideas how to expand on this activity let us know, we always love hearing from you!